I am working on my Valentines Day card for this year. It takes me a couple days to decided what I want to do each year. This year, I was wanted to use my AccuQuilt Heart Die but step it up even more. 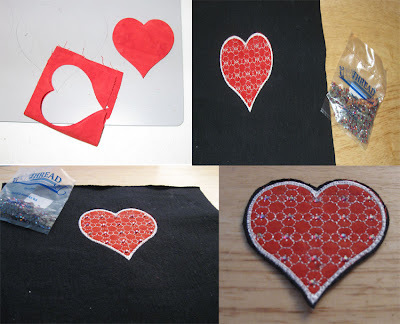 I thought I would applique it to a background fabric first and then add a embroidered design on top of it. 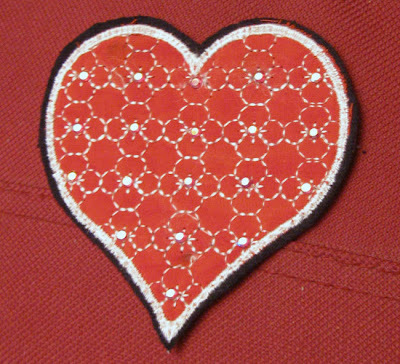 It took me a couple tries to get the embroidery just right around the heart. Then, of course, I needed to figure out how to put some bling on it. I thought I would add a sparkle in the center of each flower embroidered with heat set rhinestones. I just can't get a great photo of it but I'm really pleased with the outcome. Next steps are to send this cut out heart through the Xyron to add a permanent adhesive to the back and then I'll try and incorporate it into this years card. More to come when the card takes more shape. Hope you are having a great weekend!